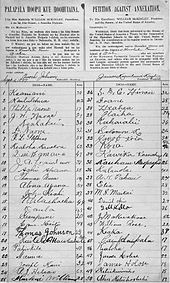 The overthrow of the Kingdom of Hawaii began on January 17, 1893, with a coup d'état against Queen Liliʻuokalani on the island of Oahu by subjects of the Kingdom of Hawaii, United States citizens, and foreign residents residing in Honolulu. A majority of the insurgents were foreigners. They prevailed upon American minister John L. Stevens to call in the U.S. Marines to protect United States interests, an action that effectively buttressed the rebellion. The revolutionaries established the Republic of Hawaii, but their ultimate goal was the annexation of the islands to the United States, which occurred in 1898. The USS Boston's landing force on duty at the Arlington Hotel, Honolulu, at the time of the overthrow of the Hawaiian monarchy, January 1893. Lieutenant Lucien Young, USN, commanded the detachment, and is presumably the officer at right. The Kamehameha Dynasty was the reigning monarchy of the Kingdom of Hawaii, beginning with its founding by Kamehameha I in 1795, until the death of Kamehameha V in 1872 and Lunalilo in 1874. On July 6, 1846, U.S. Secretary of State John C. Calhoun, on behalf of President Tyler, afforded formal recognition of Hawaiian independence under the reign of Kamehameha III. As a result of the recognition of Hawaiian independence, the Hawaiian Kingdom entered into treaties with the major nations of the world and established over ninety legations and consulates in multiple seaports and cities. The kingdom would continue for another 21 years until its overthrow in 1893 with the fall of the House of Kalākaua. Sugar had been a major export from Hawaii since Captain James Cook's arrival in 1778. The first permanent plantation in the islands was on Kauai in 1835. William Hooper leased 980 acres (4.0 km2) of land from Kamehameha III and began growing sugar cane. Within thirty years there would be plantations on four of the main islands. Sugar had completely altered Hawaii's economy. United States influence in Hawaiian government began with American-born plantation owners demanding a say in Kingdom politics. This was driven by missionary religion and the economics of the sugar industry. Pressure from these foreign born politicians was being felt by the King and chiefs with demands of land tenure. After a five month occupation by the British in 1843, Kamehameha III relented to the foreign advisors to private land demands with the Great Māhele, distributing the lands as pushed on heavily by the missionaries, including Gerrit P. Judd. During the 1850s, the U.S. import tariff on sugar from Hawaii was much higher than the import tariffs Hawaiians were charging the U.S., and Kamehameha III sought reciprocity. The monarch wished to lower the tariffs being paid out to the U.S. while still maintaining the Kingdom's sovereignty and making Hawaiian sugar competitive with other foreign markets. In 1854 Kamehameha III proposed a policy of reciprocity between the countries but the proposal died in the U.S. Senate. As early as 1873, a United States military commission recommended attempting to obtain Ford Island in exchange for the tax-free importation of sugar to the U.S. Major General John Schofield, U.S. commander of the military division of the Pacific, and Brevet Brigadier General Burton S. Alexander arrived in Hawaii to ascertain its defensive capabilities. United States control of Hawaii was considered vital for the defense of the west coast of the United States, and they were especially interested in Pu'uloa, Pearl Harbor. The sale of one of Hawaii's harbors was proposed by Charles Reed Bishop, a foreigner who had married into the Kamehameha family, had risen in the government to be Hawaiian Minister of Foreign Affairs, and owned a country home near Pu'uloa. He showed the two U.S. officers around the lochs, although his wife, Bernice Pauahi Bishop, privately disapproved of selling Hawaiian lands. As monarch, William Charles Lunalilo, was content to let Bishop run almost all business affairs but the ceding of lands would become unpopular with the native Hawaiians. Many islanders thought that all the islands, rather than just Pearl Harbor, might be lost and opposed any cession of land. By November 1873, Lunalilo canceled negotiations and returned to drinking, against his doctor's advice; his health declined swiftly, and he died on February 3, 1874. Lunalilo left no heirs. The legislature was empowered by the constitution to elect the monarch in these instances and chose David Kalākaua as the next monarch. The new ruler was pressured by the U.S. government to surrender Pearl Harbor to the Navy. Kalākaua was concerned that this would lead to annexation by the U.S. and to the contravention of the traditions of the Hawaiian people, who believed that the land ('Āina) was fertile, sacred, and not for sale to anyone. In 1874 through 1875, Kalākaua traveled to the United States for a state visit to Washington DC to help gain support for a new treaty. Congress agreed to the Reciprocity Treaty of 1875 for seven years in exchange for Ford Island. After the treaty, sugar production expanded from 12,000 acres (49 km2) of farm land to 125,000 acres (510 km2) in 1891. At the end of the seven-year reciprocity agreement, the United States showed little interest in renewal. On January 20, 1887, the United States began leasing Pearl Harbor. Shortly afterwards, a group of mostly non-Hawaiians calling themselves the Hawaiian Patriotic League began the Rebellion of 1887. They drafted their own constitution on July 6, 1887. 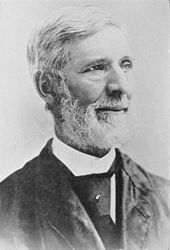 The new constitution was written by Lorrin Thurston, the Hawaiian Minister of the Interior who used the Hawaiian militia as threat against Kalākaua. Kalākaua was forced under threat of assassination to dismiss his cabinet ministers and sign a new constitution which greatly lessened his power. It would become known as the "Bayonet Constitution" due to the threat of force used. The Bayonet Constitution allowed the monarch to appoint cabinet ministers, but had stripped him of the power to dismiss them without approval from the Legislature. :152 Eligibility to vote for the House of Nobles was also altered, stipulating that both candidates and voters were now required to own property valuing at least three thousand dollars, or have an annual income of no less than six hundred dollars. This resulted in disenfranchising two thirds of the native Hawaiians as well as other ethnic groups who had previously held the right to vote but were no longer able to meet the new voting requirements. This new constitution benefited the white, foreign plantation owners. With the legislature now responsible for naturalizing citizens, Americans and Europeans could retain their home country citizenship and vote as citizens of the kingdom. Along with voting privileges, Americans could now run for office and still retain their United States citizenship, something not afforded in any other nation of the world and even allowed Americans to vote without becoming naturalized. Asian immigrants were completely shut out and were no longer able to acquire citizenship or vote at all. At the time of the Bayonet Constitution Grover Cleveland was president, and his secretary of state Thomas F. Bayard sent written instructions to the American minister George W. Merrill that in the event of another revolution in Hawaii, it was a priority to protect American commerce, lives and property. 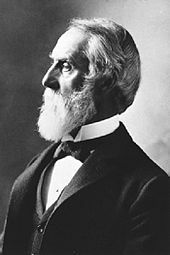 Bayard specified, "the assistance of the officers of our Government vessels, if found necessary, will therefore be promptly afforded to promote the reign of law and respect for orderly government in Hawaii." In July 1889, there was a small scale rebellion, and Minister Merrill landed Marines to protect Americans; the State Department explicitly approved his action. 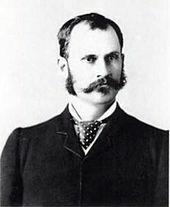 Merrill's replacement, minister John L. Stevens, read those official instructions, and followed them in his controversial actions of 1893. The Wilcox Rebellion of 1888 was a plot to overthrow King David Kalākaua, king of Hawaii, and replace him with his sister in a coup d'état in response to increased political tension between the legislature and the king after the 1887 constitution. Kalākaua's sister, Princess Liliʻuokalani and his wife, Queen Kapiolani, returned from Queen Victoria's Golden Jubilee immediately after news reached them in Great Britain. In October 1887, Robert William Wilcox, Kalākaua's distant cousin, a native Hawaiian officer and veteran of the Italian military, returned to Hawaii. The funding had stopped for his study program when the new constitution was signed. Wilcox, Charles B. Wilson, Princess Liliʻuokalani, and Sam Nowlein plotted to overthrow King Kalākaua to replace him with his sister, Liliʻuokalani. 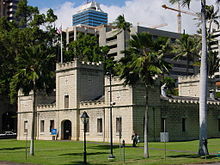 They had 300 Hawaiian conspirators hidden in ʻIolani Barracks and an alliance with the Royal Guard, but the plot was accidentally discovered in January 1888, less than 48 hours before the revolt would have been initiated. No one was prosecuted but Wilcox was exiled. So on February 11, 1888, Wilcox left Hawaii for San Francisco, intending to return to Italy with his wife. Princess Liliʻuokalani was offered the throne several times by the Missionary Party who had forced the Bayonet Constitution on her brother, but she believed she would become a powerless figurehead like her brother and rejected the offers outright. In November 1889, Kalākaua traveled to San Francisco for his health, staying at the Palace Hotel. He died there on January 20, 1890. 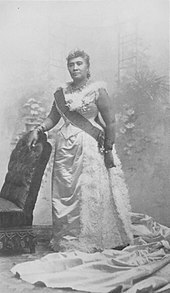 His sister Liliʻuokalani assumed the throne in the middle of an economic crisis. The McKinley Act had crippled the Hawaiian sugar industry by removing the duties on sugar imports from other countries into the US, eliminating the previous Hawaiian advantage gained via the Reciprocity Treaty of 1875. Many Hawaii businesses and citizens felt pressure from the loss of revenue; in response Liliʻuokalani proposed a lottery system to raise money for her government. Also proposed was a controversial opium licensing bill. Her ministers, and closest friends, were all opposed to this plan; they unsuccessfully tried to dissuade her from pursuing these initiatives, both of which came to be used against her in the brewing constitutional crisis. Liliʻuokalani's chief desire was to restore power to the monarch by abrogating the 1887 Bayonet Constitution and promulgating a new one, an idea that seems to have been broadly supported by the Hawaiian population. The 1893 Constitution would have increased suffrage by reducing some property requirements, and eliminated the voting privileges extended to European and American residents. It would have disenfranchised many resident European and American businessmen who were not citizens of Hawaii. The Queen toured several of the islands on horseback, talking to the people about her ideas and receiving overwhelming support, including a lengthy petition in support of a new constitution. However, when the Queen informed her cabinet of her plans, they withheld their support due to an understanding of what her opponents' likely response to these plans would be. Though there were threats to Hawaii's sovereignty throughout the Kingdom's history, it was not until the signing of the Bayonet Constitution in 1887 that this threat began to be realized. The precipitating event leading to the overthrow of the Kingdom of Hawaii on January 17, 1893, was the attempt by Queen Liliʻuokalani to promulgate a new constitution that would have strengthened the power of the monarch relative to the legislature, where Euro-American business elites held disproportionate power. The stated goals of the conspirators, who were non-native Hawaiian Kingdom subjects (five United States nationals, one English national, and one German national) were to depose the queen, overthrow the monarchy, and seek Hawaii's annexation to the United States. The overthrow itself was started by newspaper publisher Lorrin Thurston, a Hawaiian subject and former Minister of the Interior who was the grandson of American missionaries, and formally led by the Chairman of the Committee of Safety, Henry E. Cooper, an American lawyer. They derived their support primarily from the American and European business class residing in Hawaii and other supporters of the Reform Party of the Hawaiian Kingdom. Most of the leaders of the Committee of Safety that deposed the queen were United States and European citizens who were also Kingdom subjects. They included legislators, government officers, and a Supreme Court Justice of the Hawaiian Kingdom. On January 16, the Marshal of the Kingdom, Charles B. Wilson was tipped off by detectives to the imminent planned overthrow. Wilson requested warrants to arrest the 13-member council of the Committee of Safety, and put the Kingdom under martial law. Because the members had strong political ties with United States Government Minister John L. Stevens, the requests were repeatedly denied by Attorney General Arthur P. Peterson and the Queen’s cabinet, fearing if approved, the arrests would escalate the situation. After a failed negotiation with Thurston, Wilson began to collect his men for the confrontation. Wilson and Captain of the Royal Household Guard, Samuel Nowlein, had rallied a force of 496 men who were kept at hand to protect the Queen. The events began on January 17, 1893, when John Good, a revolutionist, shot Leialoha, a native policeman who was trying to stop a wagon carrying weapons to the Honolulu Rifles, the paramilitary wing of the Committee of Safety led by Lorrin Thurston. The Committee of Safety feared the shooting would bring government forces to rout out the conspirators and stop the overthrow before it could begin. The Committee of Safety initiated the overthrow by organizing the Honolulu Rifles, consisting of approximately 1,500 armed local (non-native) men, under their leadership, intending to depose Queen Liliʻuokalani. The Rifles garrisoned Ali'iolani Hale across the street from ʻIolani Palace and waited for the Queen's response. As these events were unfolding, the Committee of Safety expressed concern for the safety and property of American residents in Honolulu. The overthrow efforts were supported by United States Government Minister John L. Stevens with an invasion of U.S. Marines, who came ashore at the request of the conspirators. Advised about supposed threats to non-combatant American lives and property by the Committee of Safety, Stevens obliged their request and summoned a company of uniformed U.S. Marines from the USS Boston and 162 sailors to land on the Kingdom under orders of neutrality and take up positions at the U.S. Legation, Consulate, and Arion Hall on the afternoon of January 16, 1893. The overthrow left the queen imprisoned in ʻIolani Palace under house arrest. The United States sailors and Marines did not enter the Palace grounds or take over any buildings, and never fired a shot, but their presence served effectively in intimidating royalist defenders. Historian William Russ states, "the injunction to prevent fighting of any kind made it impossible for the monarchy to protect itself." Due to the Queen's desire "to avoid any collision of armed forces, and perhaps the loss of life" for her subjects and after some deliberation, at the urging of advisers and friends, the Queen ordered her forces to surrender. The Honolulu Rifles took over government buildings, disarmed the Royal Guard, and declared a provisional government. A provisional government was set up with the strong support of the Honolulu Rifles, a militia group who had defended the system of government promulgated by the Bayonet Constitution against the Wilcox rebellion of 1889. 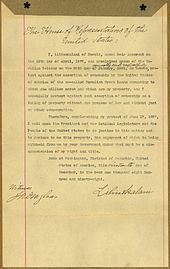 On December 19, 1898 the queen would amend the declaration with the "Memorial of Queen Liliuokalani in relation to the Crown lands of Hawaii", further protesting the overthrow and loss of property. Newly inaugurated President Grover Cleveland called for an investigation into the overthrow. This investigation was conducted by former Congressman James Henderson Blount. Blount concluded in his report on July 17, 1893, "United States diplomatic and military representatives had abused their authority and were responsible for the change in government." Minister Stevens was recalled, and the military commander of forces in Hawaiʻi was forced to resign his commission. President Cleveland stated, "Substantial wrong has thus been done which a due regard for our national character as well as the rights of the injured people requires we should endeavor to repair the monarchy." Cleveland further stated in his 1893 State of the Union Address that, "Upon the facts developed it seemed to me the only honorable course for our Government to pursue was to undo the wrong that had been done by those representing us and to restore as far as practicable the status existing at the time of our forcible intervention." The matter was referred by Cleveland to Congress on December 18, 1893, after the Queen refused to accept amnesty for the traitors as a condition of reinstatement. Hawaii President Sanford Dole was presented a demand for reinstatement by Minister Willis, who had not realized Cleveland had already sent the matter to Congress—Dole flatly refused Cleveland's demands to reinstate the Queen. The Senate Foreign Relations Committee, chaired by Senator John Tyler Morgan (D-Alabama) and composed mostly of senators in favor of annexation, initiated their own investigation to discredit Blount's earlier report, using pro-annexationist affidavits from Hawaii, and testimony provided to the U.S. Senate in Washington, D.C. Not surprisingly, the Morgan Report contradicted the Blount Report, and exonerated Minister Stevens and the U.S. military troops finding them "not guilty" of involvement in the overthrow. Cleveland became stalled with his earlier efforts to restore the queen, and adopted a position of recognition of the so-called Provisional Government and the Republic of Hawaii which followed. In 1993, the 100th anniversary of the overthrow of the Kingdom of Hawaii, Congress passed a resolution, which President Bill Clinton signed into law, offering an apology to Native Hawaiians on behalf of the United States for its involvement in the overthrow of the Kingdom of Hawaii. The law is known as the Apology Resolution, and represents one of only five times that the United States government has formally apologized for its actions. Every government with a diplomatic presence in Hawaii, except for the United Kingdom, recognized the Provisional Government within 48 hours of the overthrow via their consulates. Countries recognizing the new Provisional Government included Chile, Austria-Hungary, Mexico, Russia, the Netherlands, Imperial Germany, Sweden, Spain, Imperial Japan, Italy, Portugal, Denmark, Belgium, China, Peru, and France. When the Republic of Hawaii was declared on July 4, 1894, immediate de facto recognition was given by every nation with diplomatic relations with Hawaii, except for Britain, whose response came in November 1894. A four-day uprising between January 6 and 9, 1895, began with an attempted coup d'état to restore the monarchy, and included battles between Royalists and the republican rebels. Later, after a weapons cache was found on the palace grounds after the attempted rebellion in 1895, Queen Liliʻuokalani was placed under arrest, tried by a military tribunal of the Republic of Hawaiʻi, convicted of misprision of treason and imprisoned in her own home. On January 24, Liliʻuokalani abdicated, formally ending the Hawaiian monarchy. In 1897, William McKinley succeeded Cleveland as United States president. A year later he signed the Newlands Resolution, which provided for the annexation of Hawaii on July 7, 1898. 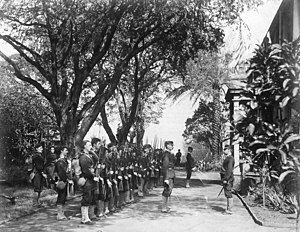 The formal ceremony marking the annexation was held at Iolani Palace on August 12, 1898. Almost no Native Hawaiians attended, and those few who were on the streets wore royalist ilima blossoms in their hats or hair, and, on their breasts Hawaiian flags with the motto: Kuu Hae Aloha ("my beloved flag"). Most of the 40,000 Native Hawaiians, including Liliʻuokalani and the royal family, shuttered themselves in their homes, protesting against what they considered an illegal transaction. "When the news of Annexation came it was bitterer than death to me", Liliʻuokalani's niece, Princess Kaʻiulani, told the San Francisco Chronicle. "It was bad enough to lose the throne, but infinitely worse to have the flag go down." The Hawaiian flag was lowered for the last time while the Royal Hawaiian Band played the Hawaiian national anthem, Hawaiʻi Ponoʻī. The Hawaiian Islands, together with the distant Palmyra Island and Stewart Islands, became the Territory of Hawaii, a United States territory, with a new government established on February 22, 1900. Sanford Dole was appointed as the first governor. ʻIolani Palace served as the capitol of the Hawaiian government until 1969. Wikimedia Commons has media related to Overthrow of the Kingdom of Hawaii. Hawaii – historical novel by James Michener has fictionalized account of the Overthrow in Chapter IV "From the Starving Village"
^ U.S. Navy History site. History.navy.mil (March 22, 2005). Retrieved on July 6, 2011. ^ a b Young, Lucien (1899). The Real Hawaii. Doubleday & McClure company. p. 252. ^ Kuykendall, Ralph (1967). The Hawaiian Kingdom, Volume 3. University of Hawaii Press. p. 605. ISBN 0-87022-433-6. ^ Congressional Record: Proceedings and Debates of the Congress. U.S. Government Printing Office. 1894. WHO WERE THE PARTIES THAT ASKED FOR AMERICAN AID. Six of them were Hawaiians, one English, and one German; five were Americans, but residents of Honolulu; a majority alien to us. ^ Margaret Homans; Adrienne Munich (October 2, 1997). Remaking Queen Victoria. Cambridge University Press. pp. 147–. ISBN 978-0-521-57485-3. ^ United States. Dept. of State (1895). Papers Relating to the Foreign Relations of the United States. U.S. Government Printing Office. p. 12. ^ United States. Congress. House. Committee on Education and Labor. Subcommittee on Economic Opportunity (1977). Economic Opportunity Act of 1964, Amendments of 1977: Hearings Before the Subcommittee on Economic Opportunity of the Committee on Education and Labor, House of Representatives, Ninety-fifth Congress, First Session, on H.R. 7577... U.S. Government Printing Office. p. 92. ^ "Historical Collections of The Hawaiian Islands – Treaties, Conventions, and International Agreements of the Kingdom of Hawai'i". usgwarchives.net. usgwarchives.net. Retrieved December 30, 2014. ^ Julia Flynn Siler (January 2012). Lost Kingdom: Hawaii's Last Queen, the Sugar Kings and America's First Imperial Adventure. Atlantic Monthly Press. pp. 220–. ISBN 978-0-8021-2001-4. ^ Deerr, Noel (1949). The History of Sugar, Volume 1. London: Chapman and Hall Ltd. OCLC 833266489. ^ Robin Santos Doak (January 1, 2003). Hawaii: The Aloha State. World Almanac Library. p. 11. ISBN 978-0-8368-5149-6. ^ Haunani-Kay Trask (January 1, 1999). From a Native Daughter: Colonialism and Sovereignty in Hawaiʻi. University of Hawaii Press. p. 7. ISBN 978-0-8248-2059-6. ^ Pratt, Helen G. (1939). In Hawaii: A Hundred Years. New York: Charles Scribner's Sons. p. 249. OCLC 12372595. ^ The Psychologists of Prejudice and Discrimination. ABC-CLIO. p. 1. ISBN 978-0-275-98234-8. ^ "Ford Island History". State of Hawaii. Retrieved May 17, 2014. ^ a b Dye, Bob (January 1, 1997). Merchant Prince of the Sandalwood Mountains: Afong and the Chinese in Hawai'i. Hawaii: University of Hawaii Press. p. 115. ISBN 978-0-8248-1772-5. ^ Daniel S. Murphree (March 9, 2012). Native America: A State-by-State Historical Encyclopedia [3 volumes]. California: ABC-CLIO. p. 268. ISBN 978-0-313-38127-0. ^ a b c d MacLeod, Roy M.; Philip F. Rehbock (January 1994). Darwin's Laboratory: Evolutionary Theory and Natural History in the Pacific. Hawaii: University of Hawaii Press. p. 494. ISBN 978-0-8248-1613-1. ^ Donald Dalton Johnson (January 1, 1995). The United States in the Pacific: Private Interests and Public Policies, 1784–1899. Greenwood Publishing Group. p. 105. ISBN 978-0-275-95055-2. ^ Jon M. Van Dyke (2008). Who Owns the Crown Lands of Hawai_i?. University of Hawaii Press. p. 118. ISBN 978-0-8248-3211-7. ^ a b Pratt, Helen G. (1939). In Hawaii: A Hundred Years. New York: Charles Scribner's Sons. pp. 260=261. OCLC 12372595. ^ Curtis, Catherine (1966). Builders of Hawaii. Hawaii: The Kamehameha Schools Press. p. 218. ASIN B00285NRCI. ^ Charles W. Calhoun (September 11, 2006). The Gilded Age: Perspectives on the Origins of Modern America. Rowman & Littlefield Publishers. pp. 316–. ISBN 978-0-7425-8168-5. ^ a b c Mirza Ph.D, Rocky M. (September 2, 2010). American Invasions: Canada to Afghanistan, 1775 to 2010: Canada to Afghanistan, 1775 to 2010. Indiana: Trafford Publishing. p. 80. ISBN 978-1-4669-5688-9. ^ Anne Lee (March 18, 2011). The Hawaii State Constitution. New York: Oxford University Press. p. 7. ISBN 978-0-19-987796-6. ^ a b Van Dyke, Jon M (2008). Who Owns the Crown Lands of Hawai_i?. Hawaii: University of Hawaii Press. p. 123. ISBN 978-0-8248-3211-7. ^ Kamaka'eha, Lydia-Lili'uokalani (1898). "Chapter 29: 'The Bayonet Constitution'". Hawaiʻi's Story by Hawaiʻi's Queen. digital.library.upenn.edu. Boston: Lee and Shepard. ISBN 9788822853684. OCLC 966288973, 903366051, 2387226. Retrieved October 27, 2017. ^ Sarah Vowell (March 22, 2011). Unfamiliar Fishes. Penguin Group US. p. 90. ISBN 978-1-101-48645-0. ^ John H. Chambers (2009). Hawaii. Interlink Books. pp. 184–85. ISBN 978-1-56656-615-5. ^ William Ming Liu; Derek Kenji Iwamoto; Mark H. Chae (January 19, 2011). Culturally Responsive Counseling with Asian American Men. Routledge. p. 133. ISBN 978-1-135-96833-5. ^ William Michael Morgan (2011). Pacific Gibraltar: U.S.-Japanese Rivalry Over the Annexation of Hawai'i, 1885–1898. Naval Institute Press. p. 57. ISBN 978-1-59114-529-5. ^ James Bradley (November 24, 2009). The Imperial Cruise: A Secret History of Empire and War. Little, Brown. p. 110. ISBN 978-0-316-03966-6. ^ Noenoe K. Silva (September 7, 2004). Aloha Betrayed: Native Hawaiian Resistance to American Colonialism. Duke University Press. p. 126. ISBN 0-8223-3349-X. ^ Florencia Mallon (December 30, 2011). Decolonizing Native Histories: Collaboration, Knowledge, and Language in the Americas. Duke University Press. p. 31. ISBN 0-8223-5152-8. ^ Campbell, Charles Soutter (1976). The transformation of American foreign relations, 1865–1900. New York: Harper & Row. pp. 178–79. ISBN 978-0-06-090531-6. OCLC 2120977. ^ Liliuokalani (1898). Hawaii's Story. Tothrop, Lee & Shepard Co. p. 174. ^ Liliuokalani (1898). Hawaii's Story. Tothrop, Lee & Shepard Co. p. 195. ^ Foreign Relations of the United States 1894: Affairs in Hawaii. Government Printing Office. 1895. p. 670. ^ Liliuokalani (1898). Hawaii's Story. Tothrop, Lee & Shepard Co. p. 186. ^ Richard Harned (February 11, 2009). The Palace Hotel. Arcadia Publishing. p. 76. ISBN 978-1-4396-3655-8. ^ Paul R. Spickard; Joanne L. Rondilla; Debbie Hippolite Wright (January 1, 2002). Pacific Diaspora: Island Peoples in the United States and Across the Pacific. University of Hawaii Press. p. 316. ISBN 978-0-8248-2619-2. ^ Eric Tyrone Lowery Love (2004). Race Over Empire: Racism and U.S. Imperialism, 1865–1900. Univ of North Carolina Press. pp. 107–. ISBN 978-0-8078-5565-2. ^ United States. Department of State (1895). Foreign Relations of the United States. U.S. Government Printing Office. p. 496. ^ Russ, The Hawaiian Revolution, p. 67: "She ... defended her act[ions] by showing that, out of a possible 9,500 native voters in 1892, 6,500 asked for a new Constitution." ^ Daws, Shoal of Time, p271: The Queen's new cabinet "had been in office less than a week, and whatever they thought about the need for a new constitution... they knew enough about the temper of the queen's opponents to realize that they would endure the chance to challenge her, and no minister of the crown could look forward... to that confrontation." ^ Kuykendall, Ralph (1967). The Hawaiian Kingdom, Volume 3. University of Hawaii Press. p. 582. ISBN 0-87022-433-6. ^ Library, University of Hawaii at Manoa Hamilton. "Annexation of Hawaii – University of Hawaii at Manoa Library". libweb.hawaii.edu. ^ Kuykendall, Ralph (1967). The Hawaiian Kingdom, Volume 3. University of Hawaii Press. pp. 533 and 587–88. ISBN 0-87022-433-6. From Kuykendall, p. 587-588: "W.D. Alexander (History of Later Years of the Hawaiian Monarchy and the Revolution of 1893, p. 37) gives the following as the wording of Thurston's motion [to launch the coup]: 'That preliminary steps be taken at once to form and declare a Provisional Government with a view to annexation to the United States.' Thurston later wrote that his motion was 'substantially as follows: "I move that it is the sense of this meeting that the solution of the present situation is annexation to the United States. "'(Memoirs, p. 250) Lt. Lucien Young (The Boston at Hawaii, p. 175) gives the following version of the motion: 'Resolved, That it is the sense of this committee that in view of the present unsatisfactory state of affairs, the proper course to pursue is to abolish the monarchy and apply for annexation to the United States.'" ^ a b c d Russ, William Adam (1992). The Hawaiian Revolution (1893–94). Associated University Presses. p. 90. ISBN 0-945636-53-9. ^ Roark, James L.; Johnson, Michael P.; Cohen, Patricia Cline; Stage, Sarah; Hartmann, Susan M. (January 9, 2012). The American Promise, Combined Volume: A History of the United States. Bedford/St. Martin's. p. 660. ISBN 978-0-312-66312-4. ^ Vernon M. Briggs (January 1, 2003). Mass Immigration and the National Interest: Policy Directions for the New Century. M.E. Sharpe. p. 72. ISBN 978-0-7656-0934-2. ^ Vernon M. Briggs (2001). Immigration and American Unionism. Cornell University Press. p. 58. ISBN 0-8014-8710-2. ^ Tom Ginsburg; Rosalind Dixon (January 1, 2011). Comparative Constitutional Law. Edward Elgar Publishing. p. 181. ISBN 978-0-85793-121-4. ^ Andrade, Jr., Ernest (1996). Unconquerable Rebel: Robert W. Wilcox and Hawaiian Politics, 1880–1903. University Press of Colorado. p. 130. ISBN 0-87081-417-6. ^ Twombly, Alexander (1900). Hawaii and its people. Silver, Burdett and company. p. 333. ^ "An Officer Shot – He Suspected There Was Ammunition on the Wagon". The Daily Bulletin. V (626). Honolulu: J. W. Robertson. January 17, 1893. p. 3. Retrieved July 27, 2016. ^ The Morgan Report, p808–809, "At the request of many citizens, whose wives and families were helpless and in terror of an expected uprising of the mob, which would burn and destroy, a request was made and signed by all of the committee, addressed to Minister Stevens, that troops might be landed to protect houses and private property. ^ Jack Utter (2001). American Indians: Answers to Today's Questions. University of Oklahoma Press. p. 414. ISBN 978-0-8061-3309-6. ^ Kinzer, S. (2006) America's Century of Regime Change from Hawaii to Iraq. p. 30. [Minister Stevens] "certainly overstepped his authority when he brought troops ashore, especially since he knew that the 'general alarm and terror' of which the Committee of Safety had complained was a fiction." ^ Burr, Lawrence (December 20, 2011). US Cruisers 1883–1904: The birth of the steel navy. Bloomsbury Publishing. p. 35. ISBN 978-1-84603-858-7. Retrieved January 16, 2018. ^ Russ, William Adam (1992). The Hawaiian Revolution (1893–94). Associated University Presses. p. 350. ISBN 0-945636-43-1. ^ a b Liliuokalani (1898). Hawaii's Story by Hawaii's Queen, Liliuokalani. Lee and Shepard. Retrieved January 15, 2018. ^ a b Grover Cleveland's Sixth State of the Union Address – via Wikisource. ^ "Liliuokalani, 1893 to Sanford B. Dole". University of Hawaii. Retrieved January 15, 2018. ^ "Memorial of Queen Liliuokalani in relation to the Crown lands of Hawaii, 12/19/1898". National Archives. The U.S. National Archives and Records Administration. Retrieved January 4, 2015. ^ The Blount Report, p1342, "In reply to the direct question from Mr. Parker as to whether this was the final decision of the Senate, I said that in my opinion it was final." ^ Grover Cleveland's 2nd Annual Message, December 3, 1894 – "Since communicating the voluminous correspondence in regard to Hawaii and the action taken by the Senate and House of Representatives on certain questions submitted to the judgment and wider discretion of Congress the organization of a government in place of the provisional arrangement which followed the deposition of the Queen has been announced, with evidence of its effective operation. The recognition usual in such cases has been accorded the new Government." ^ Native Hawaiian Study Commission: See Conclusions and Recommendations p.27 and also Existing Law, Native Hawaiians, and Compensation, pgs 333–339 and pgs 341–345 Archived July 8, 2012, at the Wayback Machine. Wiki.grassrootinstitute.org. Retrieved on July 6, 2011. ^ Lewis, Danny. "Five Times the United States Officially Apologized". Smithsonian. Retrieved November 14, 2018. ^ During the overthrow, the Japanese Imperial Navy gunboat Naniwa was docked at Pearl Harbor. The gunboat's commander, Heihachiro Togo, who later commanded the Japanese battleship fleet at Tsushima, refused to accede to the Provisional Government's demands that he strike the colors of the Kingdom, but later lowered the colors on order of the Japanese Government. Along with every other international legations in Honolulu, the Japanese Consulate-General, Suburo Fujii, quickly recognized the Provisional Government as the "de facto" legitimate successor to the monarchy. ^ The Morgan Report, p 1103–1111. Morganreport.org (February 11, 2006). Retrieved on July 6, 2011. ^ Andrade, Ernest (1996). The Unconquerable Rebel. The University Press of Colorado. p. 147. ISBN 0-87081-417-6. The provisional government, with all its faults, had major difficulties in obtaining recognition, especially from Cleveland, and it was not considered likely that the republic would have any foreign problems. Recognition albeit de facto came about even more quickly than it had in 1893, for at least there was no question of a overthrow having taken place or of the government's control of the domestic situation. ^ a b Ralph Simpson Kuykendall (1967). Hawaiian Kingdom 1874–1893, the Kalakaua Dynasty. 3. University of Hawaii Press. ISBN 978-0-87022-433-1. ^ Robert W. Brockway. "Hawai'i: America's Ally". The Spanish American War Centennial web site. Retrieved April 30, 2010. ^ Michael Tighe (August 9, 1998). "Hawaii's Own: A look at a century of annexation". Associated Press. Retrieved March 30, 2010. "Blount Report: Affairs in Hawaii (1893)". University of Hawaiʻi at Manoa Library. "The Annexation Of Hawaii: A Collection Of Documents". Hawaiian Digital Collection. University of Hawaiʻi at Manoa Library. Conklin, Kenneth R. (August 2009). "Hawaii Statehood -- straightening out the history-twisters. A historical narrative defending the legitimacy of the revolution of 1893, the annexation of 1898, and the statehood vote of 1959. FULL VERSION". Hawaiian Sovereignty: Thinking Carefully About It.